Besides being adequately researched, studied and scientifically proven to prevent (and even reverse) cardiovascular disease, cancer, diabetes, obesity and other life threatening diseases, plant-based eating can and will provide rather immediate results in terms of weight loss and management; digestion and assimilation (and excretion); boosts in energy levels; enhanced quality of sleep; alleviation of back pains and body aches; mood swings and anger management; feelings of satiety and satisfaction with eating; peace and clarity of mind; the texture and condition of head hair; and the clearness of skin, to name just a few. And, if the proven benefits don't convince you to make the switch fully to a plant-based diet and/or lifestyle, you can always start by trying for just a few days to see for yourself just how good you feel (and how truly delicious plant-based recipes taste). Literally and truthfully. For some additional motivation, see the three recommended books below that go into further detail about the benefits associated with a plant based lifestyle with regards to your own health as well as the health of our fellow animals and the health of our beloved Mother Earth. 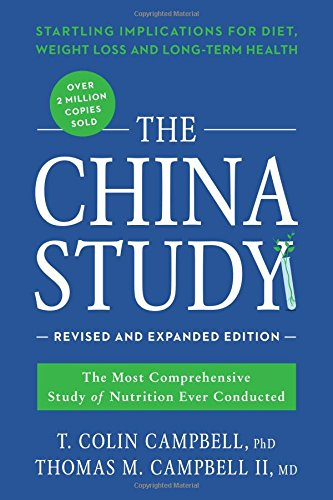 At the top of the book list is still an all-time personal favorite of mine and few other million people, The China Study. This book, perhaps one of the first most comprehensive studies to be conducted about human dietary nutrition and health, literally provides startling implications regarding human diet and weight loss as well as other long-term health characteristics. If the title of this book alone doesn't make the hairs on the back of your neck rise while providing that ecstasy like feeling of goosebumps, then maybe a blurb quoted from the book's description will, "From the physician behind the wildly popular website NutritionFacts.org, How Not to Die reveals the groundbreaking scientific evidence behind the only diet that can prevent and reverse many of the causes of disease-related death." Whenever I recommend books to read regarding plant-based living (and all of the health benefits achieved there from), I usually start with this Forks Over Knives book because it is honestly the fastest and most informative (and easy to) read for those that are not yet familiar with the idea of plant based living. Plus, this version of Forks Over Knives comes with packed with (delicious) recipes to make it even easier to get started. Need some more help getting started? If you feel like you may need some more help and/or convincing with making the (logical) switch to a plant-based lifestyle so that you can begin to live your life to the fullest and as healthy as humanly possible, contact me and we can schedule a best time for you to talk. Previously coming from the meat-eating lifestyle, I know all about the objections, obstacles and otherwise obstructions that can make the switch harder than it truly needs to be. Once you do make the switch you will fully feel the benefits both from the inside of your body (in terms of how you feel; your energy levels; your level of focus; your hunger cravings; your back pains; your body aches; your ongoing illnesses; your quality of sleep; your mood swings; et al) and from the outside of your body (in terms of how fit you will become as you naturally lose excess weight; your skin tone and clearness; the skeletal structure of your face and cheeks; the texture and feel of your hair; et al). Thank you for contacting me, I will follow up with you shortly to discuss.